There are many examples of bridges that fall into one category or the other, with a couple more set to follow in the coming year. This includes the reconstruction of the Sutliff Bridge in Iowa, where the eastern most span, which was destroyed by flooding in 2008- will be rebuilt but usingriveted connections instead of pinned connections, like the other two spans. But suppose, by looking at the picture above that one half of the span was not destroyed but instead was in the midst of being reconstructed, and therefore receiving the nickname, the un-covered bridge because of the arches that were supposed to support the trusses but instead is just sitting there with its future on the line…. There is an explanation to this rather unique appearance, which can only be given by the person who has been there to see the bridge. Kaitlin O’shea of Preservation in Pink, a website devoted to the preservation of historic places in her home state of Vermont and elsewhere, wrote a short article about this bridge awhile back and has taken up the offer to explain about the Un-covered Bridge as a guest columnist for the Bridgehunter’s Chronicles. Here is her story on this bridge, where it is located and what the plans are for restoring it for future use…. The Taftsville Covered Bridge spans the Ottaquechee River in Taftsville (Woodstock), Vermont. Designed and constructed in 1836 by Solomon Emmons III, this two-span, modified multiple kingpost truss with semi-independent arch is a rare example of early craftsman tradition; it does not reflect influences from any of the bridge patent patterns available at the time. Its design is considered somewhat unorthodox for American construction, though possibly influenced by Swiss designs. HAER documentation identifies the current covered bridge as the fourth Taftsville bridge in this location. The original bridge was built in the late 18th century in order to serve the thriving settlements on both banks of the Ottaquechee, including a power plant, gristmill, chair factory, brickyard, blacksmith, tannery and slaughterhouse. After floods washed out the first bridges, the town likely needed a stronger bridge, which led to Emmons’ design and construction. Since its construction there have been repairs and alterations, such as the arches, which were added in the early 20th century; exact reasons remain unknown. Substantial rehabilitation occurred in the early 1950s. A multi-million dollar restoration project for the Taftsville Covered Bridge was programmed into the Vermont Agency of Transportation’s project schedule and on track to begin in 2012. However, the August 28, 2011 flooding caused by Tropical Storm Irene that hammered much of the State of Vermont changed project plans. Windsor County, where Taftsville is located, was one of the five hardest hit counties in Vermont (which has 14 counties). While the Taftsville Covered Bridge did not suffer the fate of the Bartonsville Covered Bridge, which was destroyed when it was washed off its abutments, it still saw incredible damage. Following the flooding, the bridge was closed to pedestrian and vehicular traffic. Inspections in the upcoming weeks revealed a failing western abutment (Route 4 side of the bridge), to the extent that it threatened the stability of the bridge. The stone abutment faced an unsecure earthen riverbank, and material had washed downstream with the floodwaters. As a result the timber arch slipped and threatened to be unable to support the bridge until restoration. In addition, the central pier was damaged during the flood. 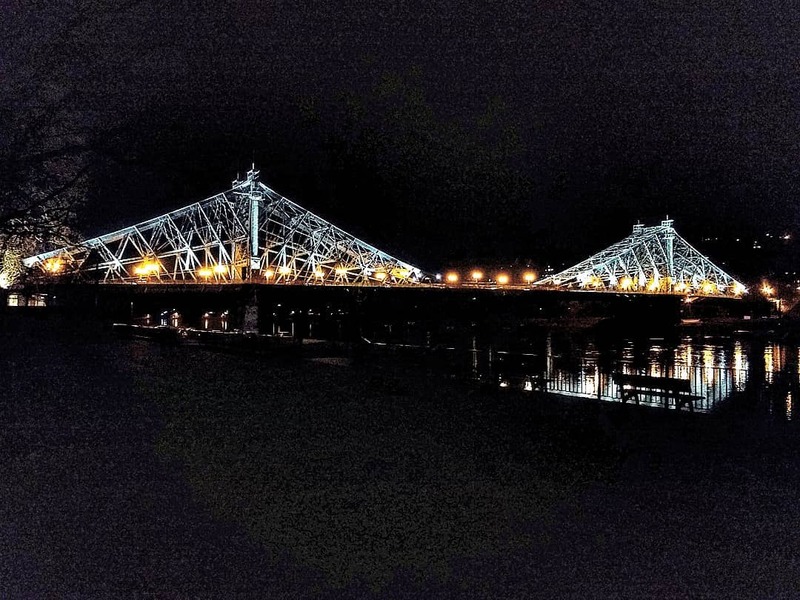 In order to stabilize the bridge before winter began (even though winter barely showed in Vermont this year), the Vermont Agency of Transportation carried out a strengthening and lightening plan. In other words: strengthen the arches with tension rods, and remove the dead load: the siding, deck, and distribution beams – essentially, everything except the arches. The abutment that remains and the central pier are strong enough to support one full span and one light span. The benefit to this method is that the entire bridge does not have to be removed, which saves additional work and keeps the bridge in everyone’s sights. A creative stabilization plan was necessary at this location due to several obstacles including an adjacent power plant and low power lines, which would inhibit the entrance of construction equipment and vehicles. And that is how Taftsville became the Un-Covered Bridge. A restoration plan is still on track for the Taftsville Covered Bridge, though it may be a total of two years before the bridge is open to traffic. Kaitlin O’Shea is a historic preservationist by education, profession and avocation. She is currently a Historic Preservation Specialist with the State of Vermont, and previously an oral history project manager in North Carolina. Kaitlin has been writing Preservation in Pink since 2007, when she realized just how much she missed the caffeinated conversations and company of her preservation colleagues. What began as a preservation newsletter evolved to the daily blog that discusses historic preservation on all fronts, aiming to present subjects as approachable and applicable to everyone, no matter what his/her background. The author would like to thank her for the use of her photos. They were taken in September 2011 and March 2012 respectively with her iPhone, and contrary to her opinion about the photos, they came out well on this column. Ambridge-Woodlawn Bridge to be rehabbed. A step in the right direction for preserving Pennsylvania’s (remaining) historic bridges? Thank you for sharing this article and photos concerning the damage done to the bridge my grandfather (3 times removed) constructed. After seeing the video’s of the river in flood, it is testimony to its superior construction that it survived at all. Actually Solomon, Jr., the father of Solomon III, was my grandfather (3 times removed). Solomon III was his son. According to local histories it appears that the present bridge is the most recent of several in that location and that his grandfather Solomon, Sr. and father Solomn, Jr. may have had a hand in constructing those. It is also stated in the histories that when Solomon III died that the care of the bridge was taken over by his son Edwin C. Emmons. Edwin and his wife Julia did not have any children. My great great grandfather worked for Edwin C. Emmons on his farm in Taftsville, VT. Could you give me the location of the farm.